Brian: "We have a piece of memorabilia that appears that in might be a replica of a winning # 7 car. 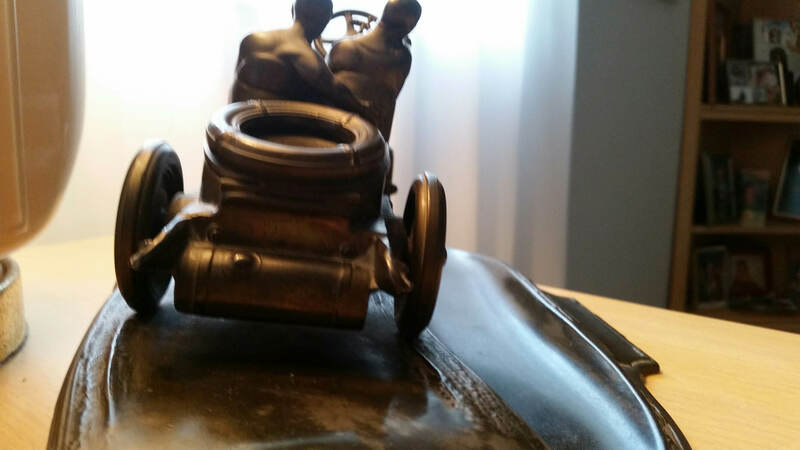 The piece has no markings or inscriptions with exception of the underside of the desk top car mounting plate where there is a number ‘4’ scratched-in and over a couple of times. We have no idea of its history or origins. My father traded something for it many years ago and unfortunately can no longer remember its history. The car is 9” inches long and is mounted to the plate from the underside with four small screws tapped into the car tires. The two Blue Glass inkwells are in excellent condition and presumed original. We hope that you might be able to identify its origins. Any help would be greatly appreciated and thank you for your time." This silver-plated instand was made by a German company Kaiserzinn circa 1907. The artist is unknown but was likely inspired by a painting by Ernest Montaut (see below) . The bonnet of the racer lifts for a glass liner for the inkwell. The rear spare tire lifts to reveal a stamp compartment. There is a pen tray in the front. 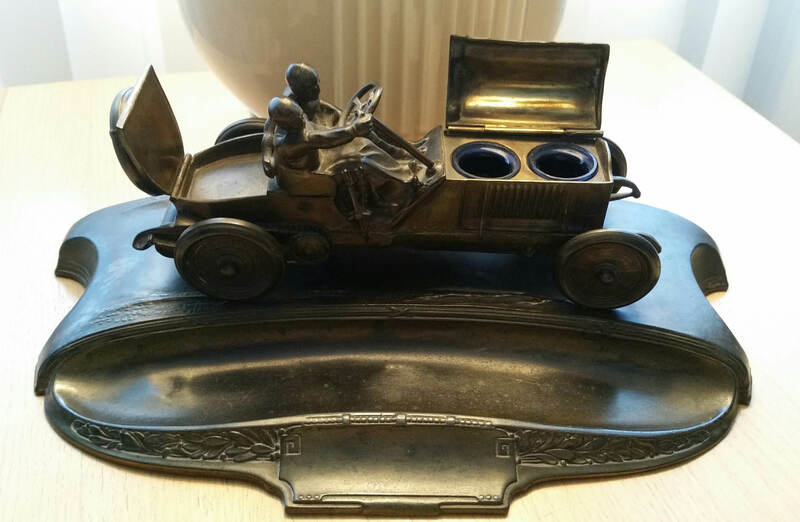 Kaiserzinn of Germany: a very rare silvered metal inkstand in the form of a 1907 Lorraine-Dietrich racing car with driver and co-driver. German circa 1907. Length: 12 inches (30 cm). This is an important Edwardian motoring desk piece, modelled on the Lorraine-Dietrich. 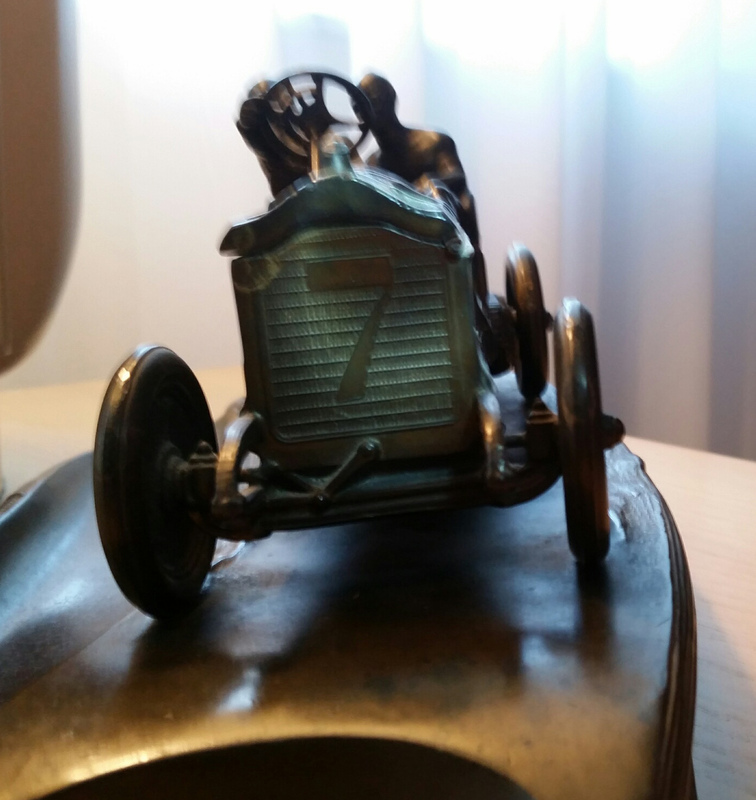 One of the rarest of all desk pieces, it depicts Arthur Duray, victor of the 1906 Circuit des Ardennes, and his riding mechanic at speed on the powerful 130hp racer. Lorraine-Dietrich, distinguished by the Cross of Lorraine emblem to the radiator, built some of the finest racing cars of all time. Duray's victory is commemorated in ceramic tile form in a rendering of his historic victory by foremost French illustrator Ernest Montaut, forming a sequence of 34 panels and destined for the Michelin headquarters in London's Brompton Cross. All the panels mark the pioneer racing achievements of the tyre maker and, still extant, are widely admired by visitors at the suitably named Bibendum restaurant. Our gallery price for this piece is £7,500.00 ($11,750). The racer was identified as a Lorraine-Dietrich. 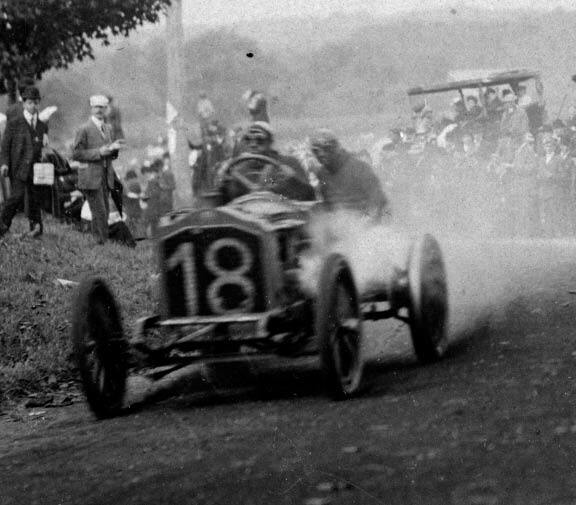 It is likely the #7 Lorraine Dietrich driven by Belgium born Arthur Duray that won the Circuit des Ardennes held in Belgium on August 13, 1906. 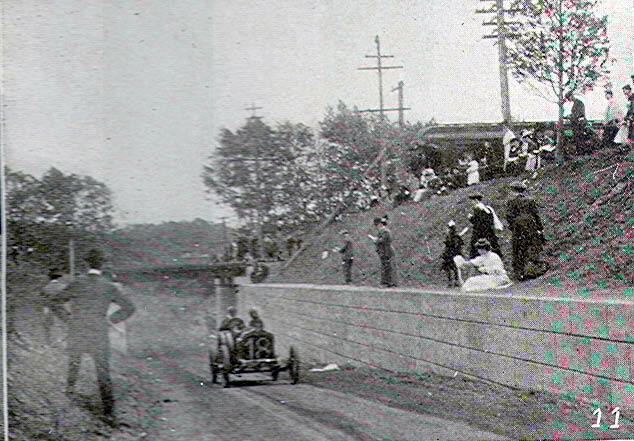 Duray competed with this Lorraine-Dietrich in the 1906 Vanderbilt Cup Race finishing third. 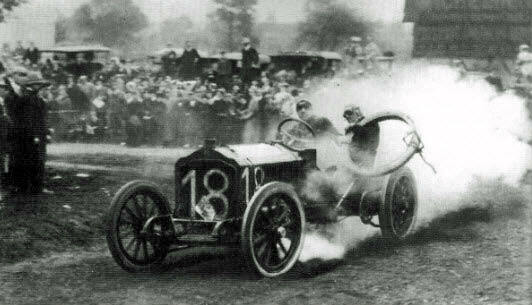 Duray also raced in the 1905 Vanderbilt Cup Race driving a DeDietrich to ninth place. Congrats to Steve Lucas, Ariejan Bos and Gary Hammond for identifying the Lorraine-Dietrich. Kudos to Steve Lucas and Gary Hammond for identifying its manufacturer! 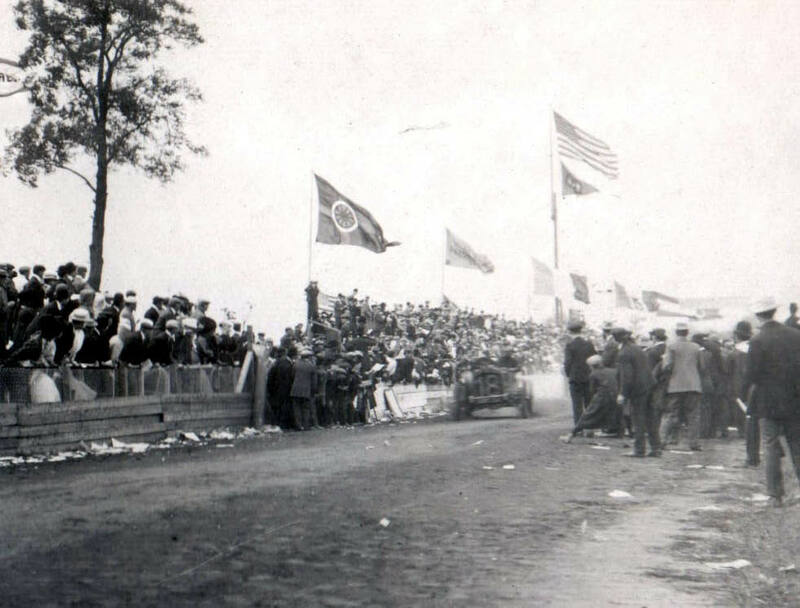 One of the stirring moments that built the legend of the Vanderbilt Cup Race thrilled the crowd at the “Hairpin Turn.” A spare tire and rim strapped to the back of the #18 Lorraine-Dietrich broke loose and began to thrash the gas tank. Riding mechanician Franville clutched the heavy mounted tire and lost his balance. 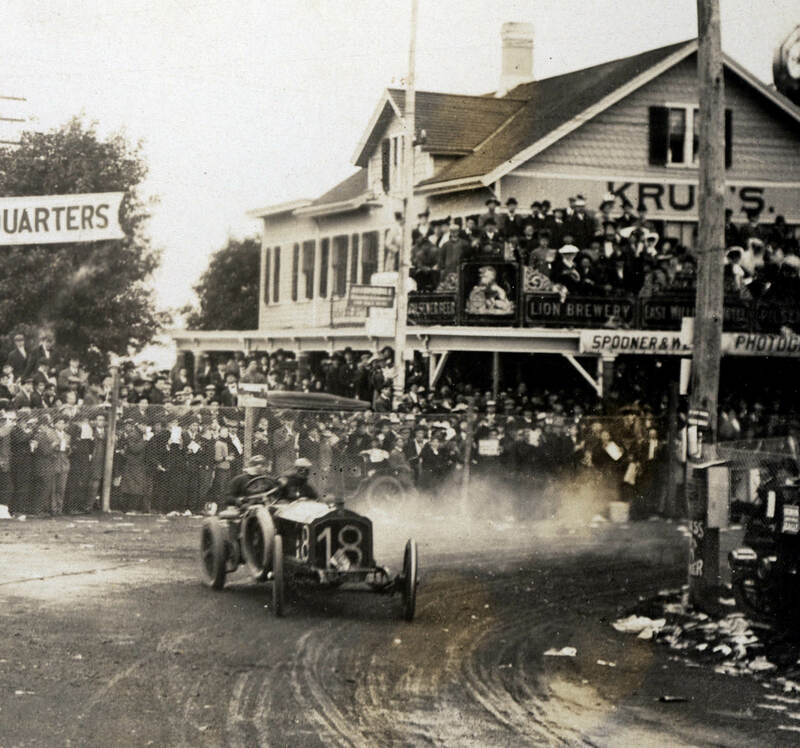 Just as the car skidded through the turn, the driver Arthur Duray handled the tight corner with one hand on the wheel while rescuing his assistant with his left arm. This inkwell / deskset was manufactured in Germany by Kaiserzinn (Kaizer Zinn) in 1907. 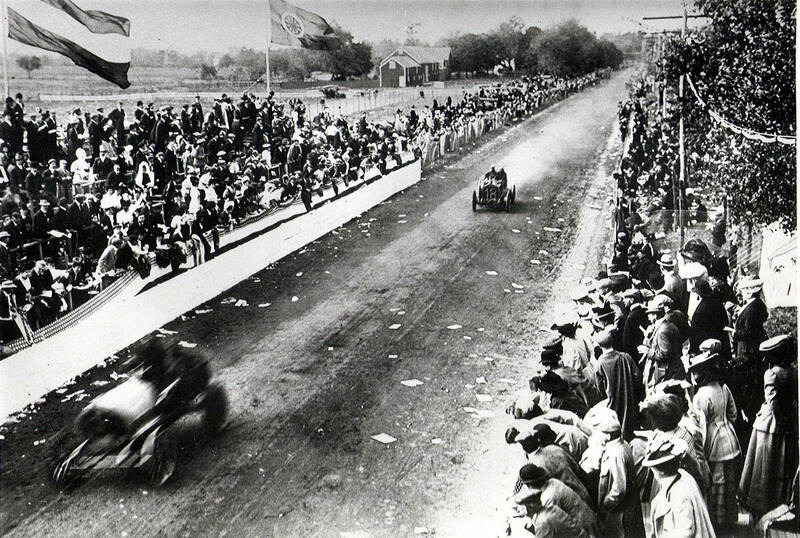 It shows the Lorraine-Dietrich racer with Arthur Duray driving (probably with his mechanician Franville). It was most likely based on illustrations done by well known French illustrator Ernest Montaut (1879-1909) who produced several images of the winner of the 1906 Circuit des Ardennes. The V. C. R. connection is: Duray competed for 2 Vanderbilt Cups, finishing 9th. in 1905 and 3rd. in 1906. The bronze probably shows the winning combination of the 1906 Circuit des Ardennes: Arthur Duray on a Lorraine-Dietrich with number 7. About the artist I wouldn’t know, but I guess it was not a prize but just an ‘objet d’art’ for daily use. Such objects were indeed rather popular during these days and are very valuable now if original. This is a German made inkstand designed and manufactured by Kaiser Zinn (also spelled Kayserzinn), ca. 1907. 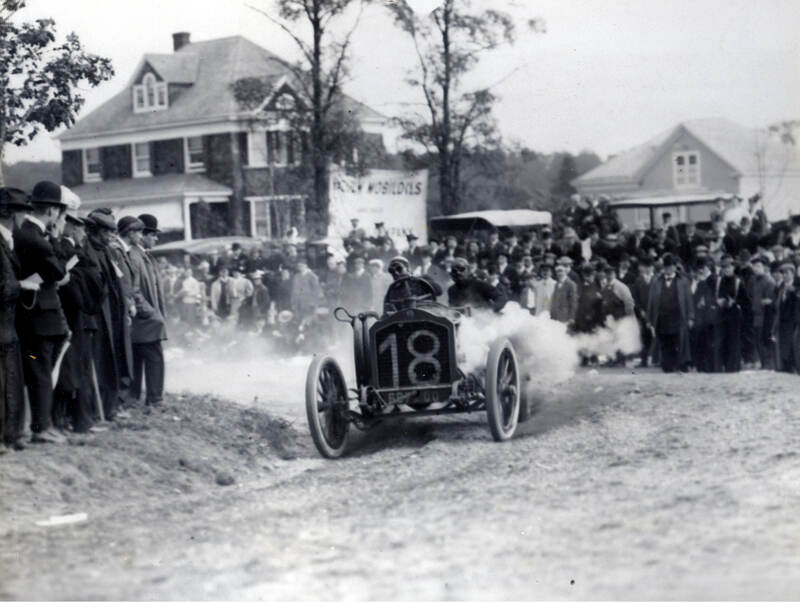 It shows a 1907 Lorraine-Dietrich racing car, with 2 inkwells under the hood, and storage for postage stamps under the spare tires. In front, running alongside the car is the pen tray. What’s going on here,just three of us gave it a try?